Best poster presentation to Kamlesh Panwar in the category 'Green Synthesis and Cleaner Production' at India International Science Festival (IISF) 2016, December 08 - 11, 2016, National Physical Laboratory, New Delhi, India. Best oral presentation to Kamlesh Panwar at Student Award Contest, BITERM 2016, April 15-17, 2016, IIT Delhi, New Delhi, India. Best poster presentation to Kamlesh Panwar at Textile Academia 2016, Feb. 17-18, 2016, IIT Delhi, New Delhi, India. Teaching Excellence Award 2015-16 to Prof Ashwini K. Agrawal presented by Indian Institute of Technology Delhi on the Institute's Foundation Day, 27 January 2016. The Anupa Sahi Siddhu Gold Medal for excellence in the Doctoral work at Lady Irwin College to Nidhi Goyal in March 2015. NanoSciTech 2012, International Conference on Frontiers in Nanoscience, Nanotechnology and their applications: 2nd prize. Poster presentation: Nidhi Goyal, February 16-18, 2012, Panjab University. Bhawna Soni National Essay Competition on Futuristic Textiles: 2nd prize. Textile Finishing Technologies in Foreseeable Future, Nidhi Goyal, March 11-12, 2011, Department of Textile Technology, IIT DELHI. BOSS Award for the Best B. Tech. project in the Department of Textile Technology for the year 2010. Award given to Nikita Bhutani and Mahesh Ahlawat. BOSS Award for the Best B. Tech. Thesis for the year 2009 in Textile Technology. Award given to Prateek Sabharwal and Rohit Lohani. First prize in Poster Paper Competition, National Conference on “Emerging Trends in Textile, Fibre, and Apparel Engineering, March 19, 2006,Government College of Engineering & Textile Technology, Behrampore, WB; Awarded to Kartick, K. Samanta on his M. Tech. project work. 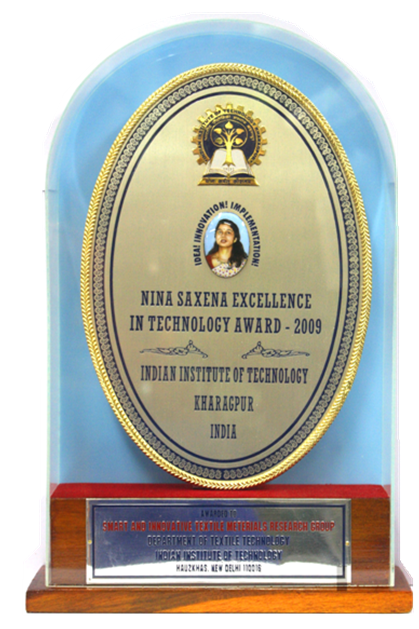 Second prize, Student research paper presentation, National Textile Seminar, IndustryInstitute Interface: Technology Development, Organized by The Textile Association (India), Lady Irwin College, February, 17 18, 2006 Delhi; Awarded to Kartick, K. Samanta for his M.Tech. work. First Position, Original Software Design Contest, DITECH-2002 Annual Technical Festival, at Netaji Subhas Institute of Technology (N.S.I.T) Delhi; Awarded to Pankaj Bansal for his work carried out during summer vacation at IIT Delhi. First Position, Software Design Contest, Mystica 2002 Annual Technical Festival, at Technological Institute of Textile & Sciences (T.I.T.S) Bhiwani (India), 2002; Awarded to Pankaj Bansal for his work carried out during summer vacation at IIT Delhi. 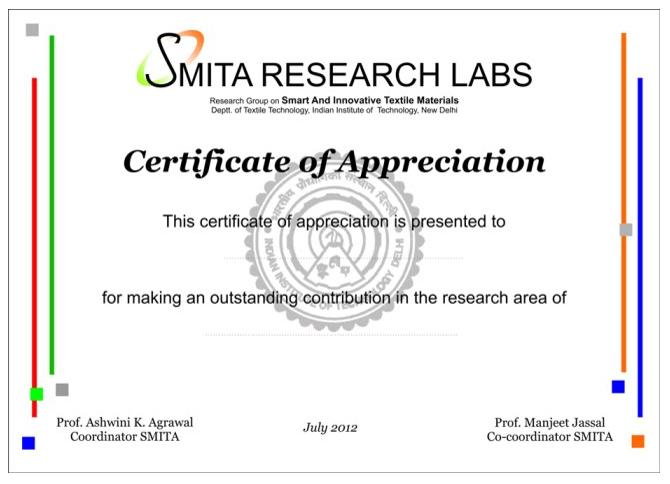 First Prize, Chemical Engineering Section, Effect of amino end group concentration on kinetics of polymerization of polyamide-6, March 2000 in TRYST-2000, awarded to S. R. Mahesh for his SURA work.